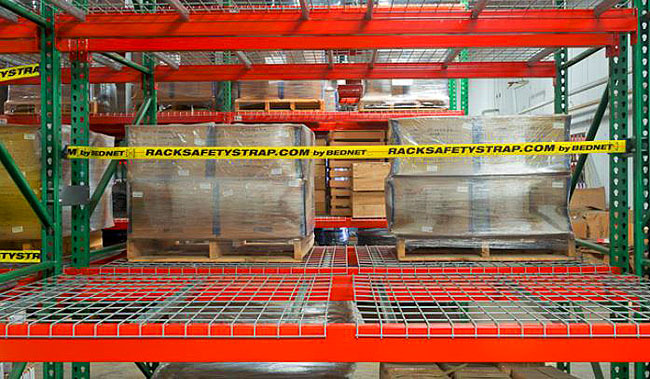 There are some inherent safety and security issues when it comes to pallet rack – goods failing to be appropriately stacked on the pallets, failing to shrink wrap goods on the pallet, over hanging pallets past the rack beams into the flue space, and failing to secure high dollar products being stored in rack bays. Each of these situations present hazards either in safety or security. When product is not well anchored to the pallet, there is a higher risk that goods will get jostled and fall off the pallet. At floor level, no big deal but at higher levels very dangerous to workers below and costly in the way of damaged goods whether those good fall off the back of the rack or the front. Poorly palletized product invites security breaches of all kinds from worker theft to visitor pilfering. 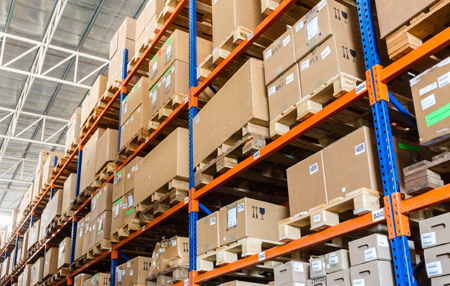 If someone can walk by your pallet racks and easily remove goods and pocket them or hide them elsewhere in the facility, you have a serious security problem and had better be doing inventory counts frequently so that you know just what your loss costs are. 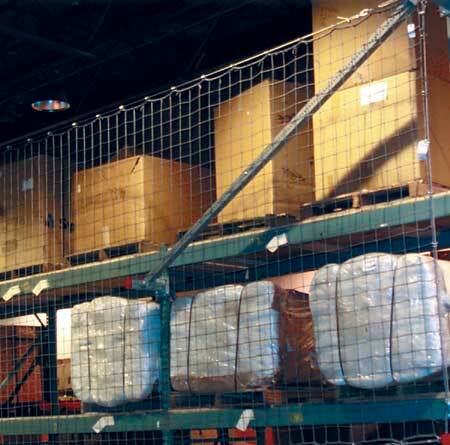 Safety netting is extremely useful in preventing losses from goods falling off the back of the pallet rack. This helps keep good from dropping down into the storage flue as well as preventing injury to workers moving behind pallet rows. The netting attaches to pallet uprights and beams at regular intervals and stretches across the back of the rack bays, providing a mesh preventive panel that helps keep goods inside the pallet bay space. Takeaway: These nets are flexible and provide 100% coverage across the back of a rack bay. They can be installed flush or offset, and are ideal when falling cartons are the major concern. Safety straps when placed at regular intervals across the vertical height of the pallet bay and stretching across from pallet uprights, also provide a safety cushion that helps keep prevent from falling into the flue space or down onto workers in aisles below. These safety straps can be used in multiples to create safety bands across the bay back or use the version with mesh panels between the top and bottom horizontal straps. Also utilize safety straps across the bay front to help stabilize pallet loads across the pallet row. Takeaway: Straps are incredibly flexible for multiple uses. You can snap in one strap for general guidance, or as many as you want to cover your load (or use a mesh panel for 100% coverage). They’re also a breeze to install, since they snap into the teardrop upright with one quick motion. If you think you might want to access the back of that rack bay, you can also pull the strap connectors out with ease. Wire enclosures help reduce pilferage. The enclosures consist of wire panels with steel framing that attaches to the pallet uprights on the row ends, across the pallet back (if pallet rows are not back to back), and hinged wire panel doors across the pallet bays to aid authorized access. Bays can be secured using locks that have the same key, or individually locked so that specific keys must be acquired. Takeaway: When security is a primary concern, these cages and enclosures allow you to control who accesses the rack – and when. These panels not only secure goods from theft, but also help keep goods from falling off onto workers below, thereby improving safety and decreasing worker injuries. Wire mesh rack guards are panels that bolt directly to pallet rack uprights to create a barrier to accessing pallet bays. The panels can be flush mounted to uprights or offset to allow for pallet overhang spacing. 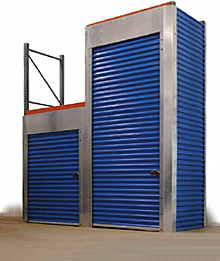 Full height swinging or sliding panels secure pallet fronts and can be locked with the addition of padlocks or other locks. Takeaway: Strong, rigid protection that helps stop cartons and loads, but also full pallets from falling. Can also guard the sides of an end bay, and allow you to segment a storage area for security and safety concerns. When securing goods is a high priority, the Trac-Rite enclosure is the perfect solution. Not only are goods secured, they are also hidden from view so that only authorized individuals know what is contained in each enclosure. Corrugated metal panels enclose the sides and back of the pallet rack. A rolling overhead panel door opens and closes to allow or lock access to goods. These fully enclosed systems can be built for entire rows of pallet or for individual bays depending on the level of security needed and division of storage space desired. Takeaway: Ideal for security applications, longer span hand loads, and storage areas where privacy is a concern. 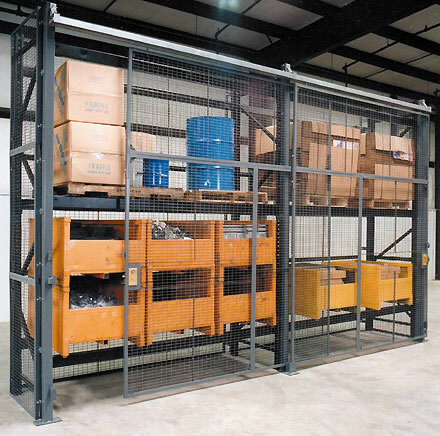 These enclosures also improve safety since goods cannot fall out of the rack space due to the fully enclosed sides, back and fronts of pallet bays. Especially in high-bay warehouses where people are working in aisles below the rack, it’s always worth protecting the aisle below, and usually not that expensive. Reduce your risks for injury claims. Protect yourself against damaged goods costs. Remember, it always impacts the bottom line.